On hard days, I have a talisman that helps me get through: my “spoonie” necklace, a bit of jewelry I made myself for just that purpose. I don’t know why, but it makes me feel better to have it on, even though no one in my life has recognised what it is and what it means. 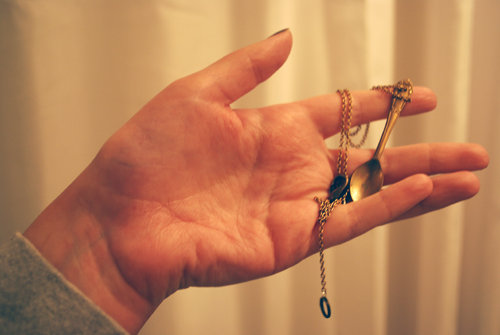 (Though, none of the usual suspects have teased me for wearing a spoon necklace, so maybe they have.) Maybe it’s the thought that someday someone who has read Christine’s “Spoon Theory” will see it and we’ll exchange a discreet nod or even grab a cup of coffee. Maybe it’s just comforting to touch it or see it or wear it and remember I’m not alone. Whatever the reason, it’s nice to have that in my pocket when I’m not feeling like myself or when I’m feeling like I’ve been run over by a Zamboni. Which seems to happen a lot these days, which I know means a change of meds at my next rheumatology appointment. But that’s getting ahead of myself. Well, because of the changeable nature of psoriatic arthritis, who knows: Maybe I’ll feel awesome tomorrow and won’t need my spoonie necklace. But, just in case, I’ll be sure to leave it within easy reach.